UC Extend expands on the capabilities of the Lync and Skype for Business clients, and best of all its free! UC Extend’s vision is to build in functionality to extend the features of the Microsoft UC client, improve user adoption by delivering managed learning, improve customer satisfaction and make administration of non-domain joined machines easier. If you find this useful and wish to support future development, please consider donating. ** Now open source on GitHub – If you are interested in contributing to the project please get in touch, we’d love to have you!! The first 5 time of day options are processed from top down, with the last enabled and active time period being of higher precedence i.e if 2 time periods overlap and are both enabled, the one lower down the list take precedence. The application will only attempt to set presence once per day, sign-in, or when settings are updated. I figured it would annoy people if the application where to override a user initiated presence change, however I am considering a “force presence” option. Set Me As options are processed in addition to the above mentioned settings and will always override the time of day settings for the period they are active. Currently both of these options revert presence back to “Available” when the conditions are no longer met and nothing else is active, however I am working on caching the previous state. Registry Monitor monitors a specified registry item, and when it changes enforces a set value. The Customer Support function allows you to add quick launch items to the task tray launcher, and provides a “Contact Support” pop up so your customers can easily get in touch. 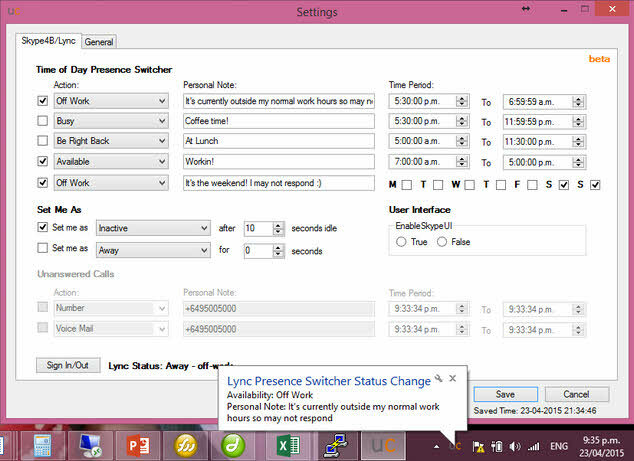 Easily add custom menu items to the Lync or Skype for Business client. Custom menu items can launch web pages or applications. On first run if the settings.xml file does not already exist, it will be automatically created. Currently only the Presense Switcher settings are avaliable from the application settings, all other settings need to be managed from the settings.xml file. Program images and icons can also be customised by overwriting the defaults with ones of the same size and type. Images are located in the program images directory. Run at Windows start up currently requires that the app runs as admin, this is problematic in newer versions of Windows that are more secure. I am close to releasing a version that stores application settings in the users AppData folder to alleviate the problem, and allow it to start. This initial fix will not help where Lync custom menus or registry watchers that access the LocalMachine registry hive are in use, but will hopefully be resolved in a later release. Build out separate app which only includes presence switching function? Glad you find it helpful! I hadn't seen your app, so will take a look. what about something useful for us who woking on the shifts? It’s very anoying to change the time. It will be perfect if I could make 3 profiles (morning shift, afternoon shift and night shift, weekend shift) and just pick the right profile and checkmark the days when I’m on duty for a whole week. It would take me 5 minutes to set the whole week and not bother with it after. Hey Ivan, good idea but I have limited time at the moment. Will consider this feature in a future release. Thanks for your feedback. Cool tool! I have a question. Is it possible to extend the contact context menu. The menu that appears when you right click a contact in your list. I want to do something I consider very simple but am not sure if it is possible. I’d like to add a url to the right click menu that goes to a dynamic url of the person’s profile. right now the urls use the same string as the sip pefix. So JDoe@contoso.com has a url of /profile/JDoe. Possible? Thanks for your feedback! Currently the tool doesn’t have any way to handle dynamic data for the creation of a URL in the context menu. It certainly wouldn’t be difficult to do, I’d just need to find the time 🙂 Your other option could be to use a GPO to push out the Lync/SfB menu’s, but I am not 100% sure how you handle dynamic data in this case.